Conflict to Conscious Communication Online Course — Emyrald Sinclaire | Manifest It A.L.L. Learn how to unravel common miscommunication problems in your relationship (and never repeat them!) and discover how to easily communicate your needs with your partner so that fights, arguments and drama never happen again! 🌟 Do you have different ways of communicating with your partner and you'd like to figure out a non-violent way to speak to him/her without causing unnecessary fights and arguments? 🌟 Are you scared of confrontation and avoid it at all costs? And when you're fighting with your partner are you frightened that it might be the last fight ever because one of you is going to walk out? 🌟 Have you ever thought your partner was acting horrible or like a jerk or completely off base…only to later realize that YOU were the one who was completely out of line because you didn't take the time to see things from their point of view? 🌟 Have you ever had a shouting match with your significant other because you couldn’t get your message across and were too stubborn to be able to ‘hear’ what they had to say? 🌟 Have you ever had to put your foot in your mouth because you spoke without thinking or without knowing all the facts or because your ego wanted to speak up? 🌟 Have you ever come to a breaking point in your most intimate relationship because you and your partner didn’t have the tools to clearly articulate your needs and desires and as a result you were at a standstill and resulted to constant bickering? I'm Emyrald and I've been EXACTLY where you are! I WORKED SO HARD TO MANIFEST THE LOVE OF MY LIFE! Attracted in the love of my life!! But when we finally moved in together, do you know what happened? We were two human beings with our own triggers. We had separate issues and fears and pain-points. And we were pointing the finger at each other and making the other person out to be wrong and the bad guy. Old fears came up and we were both scared of reliving those fears so subconsciously we both decided to self-sabotage. We became miserable... and horrible to one another! We fought about once a week and never really made up. He became angry and depressed. I became sad and pulled away. We stopped giving each other compliments and being nice to one another. It felt like a horrible combination of roommates (that used to be friends) who split the bills...but barely talked to one another! How did I save our relationship? I quite literally had an A-HA! moment one day while riding my bike and trying to figure out how we had gone down the rabbit hole of those couples that you swore you would never be like! Something I had learned in the past from one of my relationship mentors jumped into my head. And suddenly I realized where the exact stem of our relationship issues were coming from. I raced home on my bike and poured over the courses I'd done in the past. I devoured all the self-help books I'd read throughout the years and pieced together exactly the reason we were 'stuck' in this phase and how to get out of it. And I put together a plan to stop the bickering. To stop the consistency at which we were triggering each other. And most importantly, to get back to that initial 'honey-moon' phase that we'd enjoyed for the first couple of years. And slowly we started to break down the components of our personal break down. We started to build each other up and support each other instead of the constant bickering and competition. And that night, we made love! And it was amazing and connecting on such a deep soul-ful level! Miscommunication almost killed my relationship. It also lost me very loyal customers when I owned a cafe. It has caused conflict and fights on Christmas with my in-laws. And most recently, I went YEARS without speaking to my brother because of miscommunication. How many ways can you count where miscommunication is costing you so much? Costing you your job? Costing you money? Costing you a close relationship with family members? And the worse part is this: Miscommunication can be prevented! IT'S TIME FOR A FUNDAMENTAL CHANGE AS TO HOW YOU COMMUNICATE WITH YOUR LOVER SO YOU CAN EXPERIENCE A LOVE LIFE FILLED WITH GRACEFUL INTERACTIONS AND EASY LOVING COMMUNICATION! 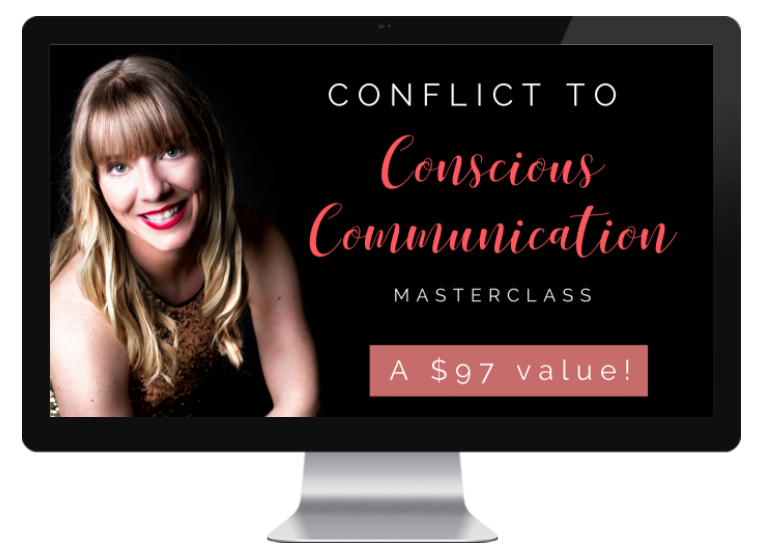 Conflict to Conscious Communication is an online program for couples looking to remove drama and miscommunication from their relationship and replace it with graceful, clear and loving interactions instead! I've created a simple (and effective) process that focuses upon core teachings and concepts that show you how to communicate clearly and with ease with your partner. When you sign up, you'll get INSTANT ACCESS to six video lessons, each with accompanying PDFs and worksheets to complete alone or with your significant other. Unhappiness in marriage often has a simple root cause: we speak different love languages, believes Dr. Gary Chapman. While working as a marriage counselor for more than 30 years, he identified five love languages: Words of Affirmation, Quality Time, Receiving Gifts, Acts of Service, and Physical Touch. Learning about the five love languages is also pertinent in how you give and receive communication with your children, your friends, your in-laws and even your colleagues! We all have two energies inside of us: masculine energy and feminine energy. And depending which one you are in at the current moment and which energy the person is in that you are talking to, this could lead to a HUGE disagreement or barriers to clear communication. This is especially important for those in intimate relationships! This lesson is especially important for couples. Learn how to 'switch roles' which means to go from your masculine to your feminine energy (or vice versa) in order to clearly articulate your needs and desires...and have them be met! *You'll also be pleased to know that what you learn in this lesson can work for tricky bosses and stubborn parents! Learn the validation technique to be used for sensitive topics or when you sense that someone is in a bad mood. Plus learn what to do when someone doesn't want to talk! This is THE formula that all must use in order to communicate with grace and ease and avoid any type of confrontation and arguments. This formula is something you'll want to write on a sheet of paper and put in your pocket and reference for the rest of your life! 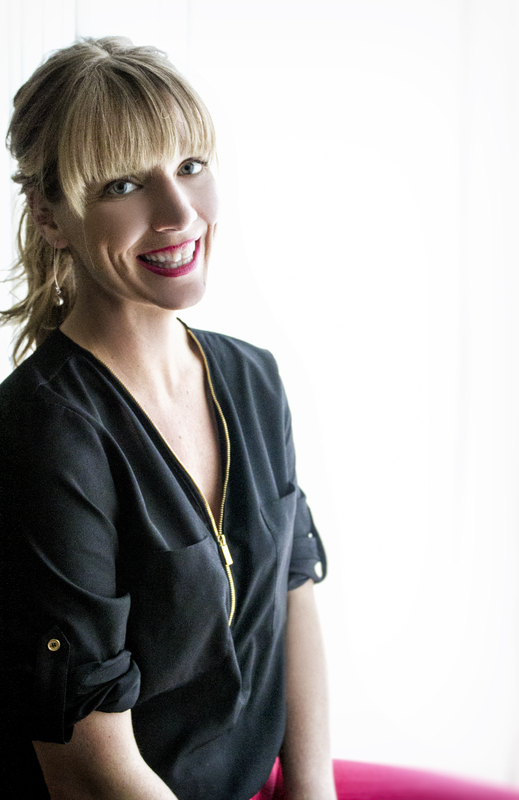 We wrap up our lessons with 'the work' of Byron Katie. It's time to reflect inwards and by doing a couple of simple exercises you will completely reframe your personal point of view in regards to past arguments and disagreements and instead walk away with peace of mind. The Work is something you'll continue to do for the rest of your life, so don't take this lesson lightly! 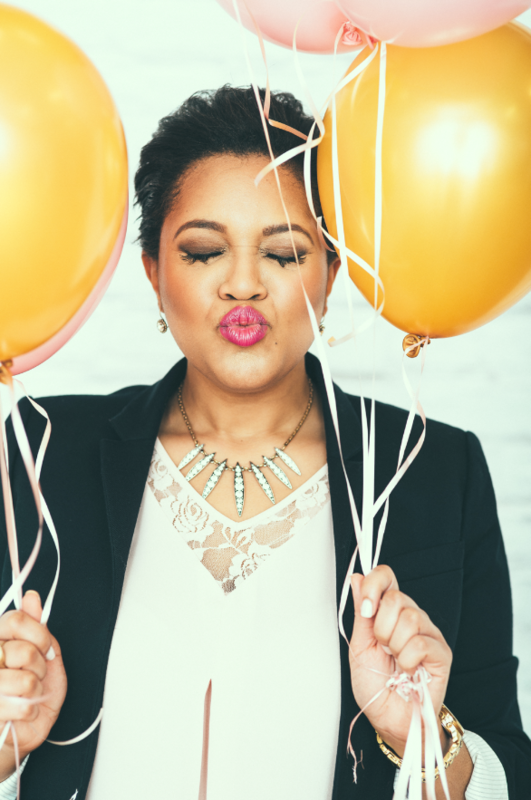 🌟 Access to a private Facebook group to connect with like-minded community to share struggles and work through issues plus the ability to ask your personal questions to me! I'm ready for Conscious Communication! One of the most helpful things that I got from this is having the framework for the Amigo Talk with my wife Nichole. I also think that using the technique for reflecting on triggers in the moment is going to be extremely helpful. Knowing that I am just mirroring my own insecurities through my triggers is huge. This was really good for me because it had me revisit my own love languages which I had not done in years, surprise surprise they are different from a few years ago. So I would say going through this course helped me identify my updated love languages, then gave us a framework to develop more meaningful communication with the Amigo Talk and a system to affect change with my own triggers when we do have a fight. Great series of videos and worksheets I am looking forward to using these more in the future to help our communication! I started working with Emyrald to improve communication with a guy I just started seeing though we’d known each other for years. In our sessions I not only discovered how I communicate and hear communication as a partner but I realized what it was that I truly desired in a relationship. For the first time in my life I was empowered to ask for what I wanted in a relationship in a way that the guy I was dating understood and respected. I was powerful and feminine at the same time. 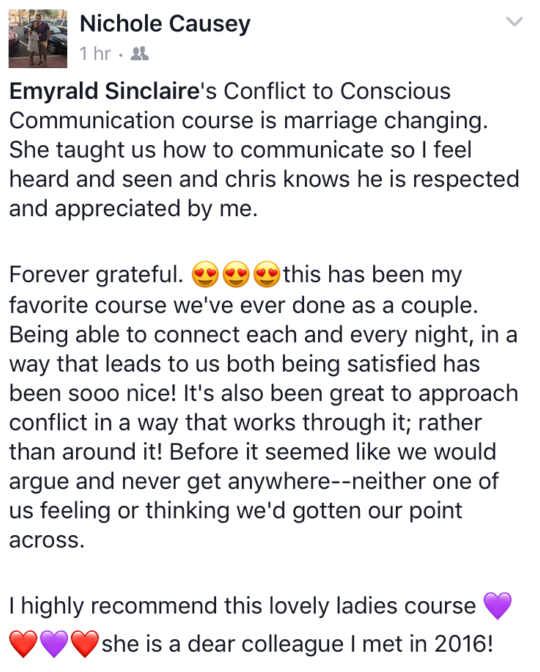 Emyrald’s “conflict to conscious communication” course is JAM PACKED with valuable information & relationship altering practices. I am ever so grateful I found Emyrald and this course because she’s truly given me the keys to communication that I always wanted but could never quite figure out on my own. 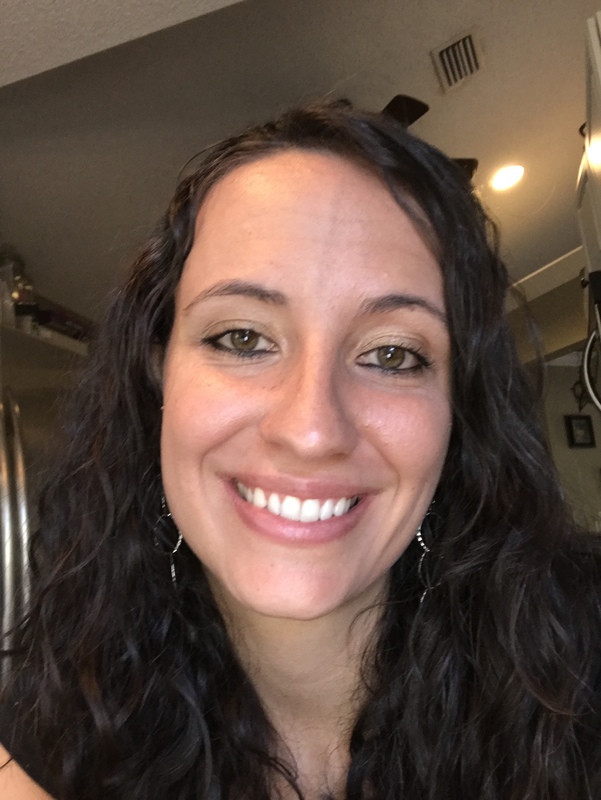 Learning about masculine and feminine energy and the amigo talk were my favorite parts because I am getting my needs met as well as meetings those of my partner. It’s no longer a huge mystery to either one of us, we are actually making traction and moving forward instead of being stuck in the same arguments all the time about each person not being heard or seen. We also learned that since we had children our love languages changed completely! Our top two are now the complete opposite of what they were before so now I understand why utilizing our previous practices were no longer working for us! 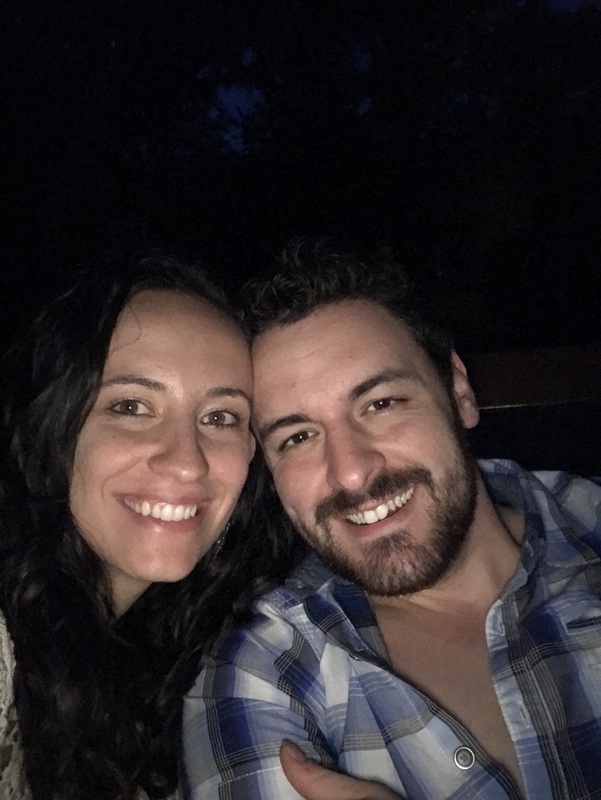 I highly recommend this course to anyone who wants to improve their communication skills with their partner; therefore, dramatically improving their intimacy and connection. Thank you so much Emyrald! Hi Emyrald! Just wanted to send you a quick (maybe not so quick) update about the (Conflict to Conscious Communication) course. My husband and I are pretty awful at communicating. One part is we speak 2 languages in the house, not only in love but also we speak Spanish and English, so sometimes things get lost in translation, literally. It took a bit of convincing to get him to start the first lesson. I watched the video and than explained in Spanish (just to make sure there was no misunderstanding), what a love language is. We talked about how his is a physical love, while mine is very highly based on service. We actually signed a contract promising each other that we will try our best to show love in the others love language! This morning I got up a little late, and the house had been swept and cleaned up, the dishes were done, and coffee was made. This is completely abnormal. Just wanted to thank you for your amazing course and I can not wait to watch more videos! I have a feeling this is going to improve our relationship a ton! You are awesome! Additional Praise for Conflict to Conscious Communication! I want you to know that we got more than we expected out of this course. My husband and I are in a difficult place. This really really encouraged him because he felt like you were on his side. This wasn’t just something I was forcing on him where another women was telling him to shape up. You were on his side (and you were on my side) and wanted him to live a happier life and have tools to learn how to do that. That is so invaluable. When you’re in crisis there is nothing more precious than hope. And good tools can make a difference. That was a big gift! So, thank you. You've really made a difference in our lives and in our children's lives. I've really enjoyed working with you! I am very glad I did this program with you. I think everyone should work with you, regardless of their relationship status or where they are at in life or if they think they need it or not. Everyone always has their ‘Work” to do. You have become a great mentor in my life and I cannot express to you how inspirational you have been. I am very grateful! My favorite part about the course was the Love Languages. 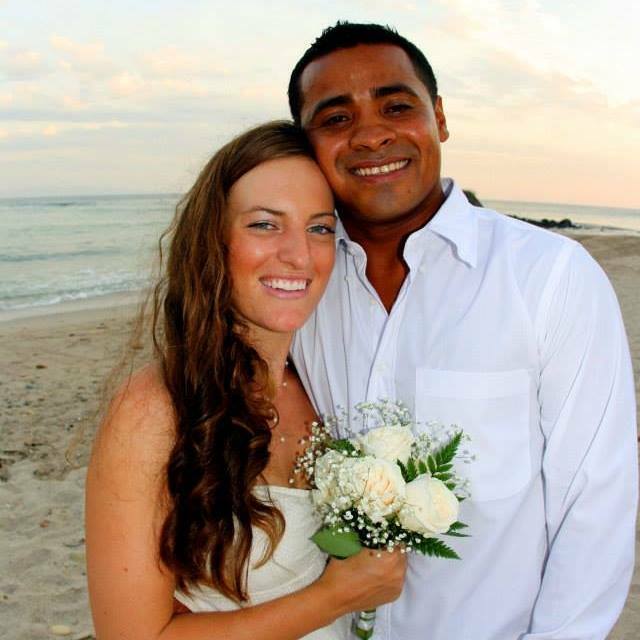 It really helped me understand my wife more and understand why it is we are doing what we are doing. You really created a wonderful, safe space to help us implement and continue communication. And you were a great, impartial mediator. I wasn't expecting that! There were difficult questions that caused self reflection, and I wasn't expecting that, either. But they were easy to do and necessary to do. Overall, I was impressed. It feels like you've researched the gamut in regards to communication and specifically focused around 'love.' And then you pared it down to the key tools that are easy to take on in little bite sized pieces. I can tell you've done the work and you have the experience and it was really simple for me to do the work you suggested without having to do my own research and try to discern what is good and what was not. I'd suggest this course to couples that are in the early stage of their relationship; to those that are past the honeymoon phase and actually don't even know that they need to know these things! You really have made a difference in our lives and I wish you so much success in your coaching business! Yes! I'm ready to Consciously Communicate!